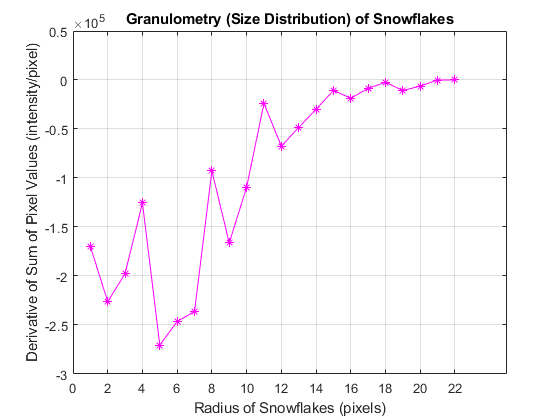 This example shows how to calculate the size distribution of snowflakes in an image by using granulometry. 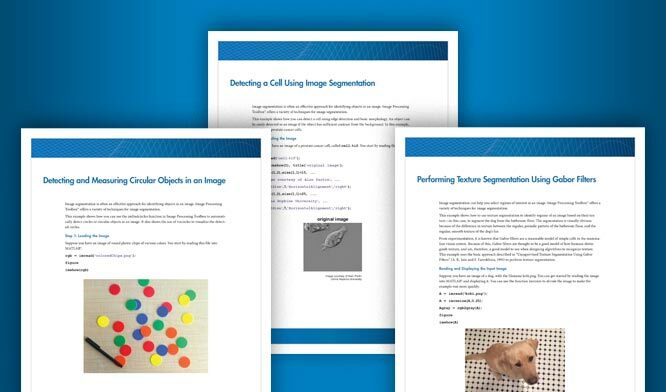 Granulometry determines the size distribution of objects in an image without explicitly segmenting (detecting) each object first. Read in the 'snowflakes.png' image, which is a photograph of snowflakes. Your first step is to maximize the intensity contrast in the image. You can do this using the adapthisteq function, which performs contrast-limited adaptive histogram equalization. Rescale the image intensity using the imadjust function so that it fills the data type's entire dynamic range. Granulometry estimates the intensity surface area distribution of snowflakes as a function of size. Granulometry likens image objects to stones whose sizes can be determined by sifting them through screens of increasing size and collecting what remains after each pass. 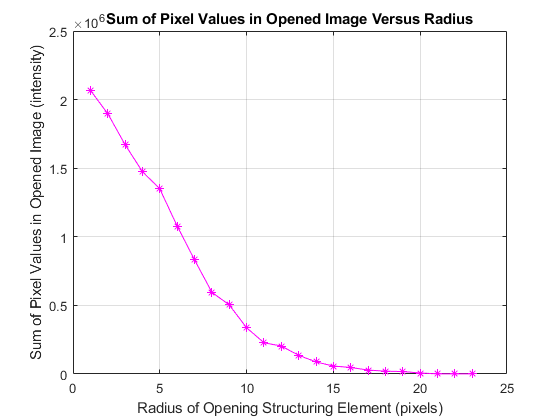 Image objects are sifted by opening the image with a structuring element of increasing size and counting the remaining intensity surface area (summation of pixel values in the image) after each opening. Choose a counter limit so that the intensity surface area goes to zero as you increase the size of your structuring element. For display purposes, leave the first entry in the surface area array empty. A significant drop in intensity surface area between two consecutive openings indicates that the image contains objects of comparable size to the smaller opening. 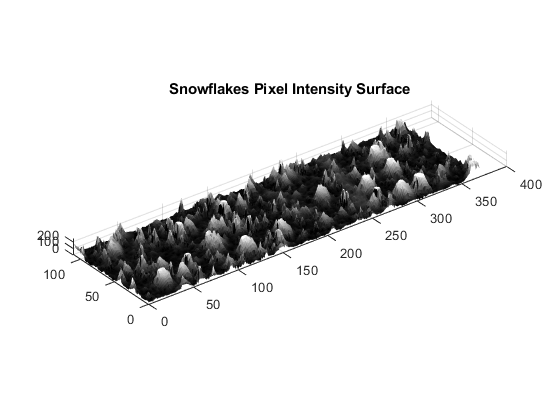 This is equivalent to the first derivative of the intensity surface area array, which contains the size distribution of the snowflakes in the image. Calculate the first derivative with the diff function. Notice the minima and the radii where they occur in the graph. The minima tell you that snowflakes in the image have those radii. The more negative the minimum point, the higher the snowflakes' cumulative intensity at that radius. For example, the most negative minimum point occurs at the 5 pixel radius mark. You can extract the snowflakes having a 5 pixel radius with the following steps.